We're sorry; this specific copy is no longer available. Here are our closest matches for Greek Poetry of the Imperial Period : An Anthology. Synopsis: This book contains a selection of pagan Greek poetic texts ranging in date from the first to the sixth century A.D. It makes easily accessible for the first time work by poets hitherto neglected in Classical syllabuses. Genres represented include epic, epyllion, didactic, epigram, lyric and the verse fable. There is a brief general introduction, and in addition each section of detailed commentary is prefaced by a discussion of literary aspects of the poems and of their wider contexts. Book Description&colon; Works by poets hitherto neglected in Classical syllabuses are made easily accessible for the first time within a selection of pagan Greek poetic texts ranging in date from the first to the sixth century A.D. Genres represented include epic, epyllion. didactic, epigram, lyric and the verse fable. 1. 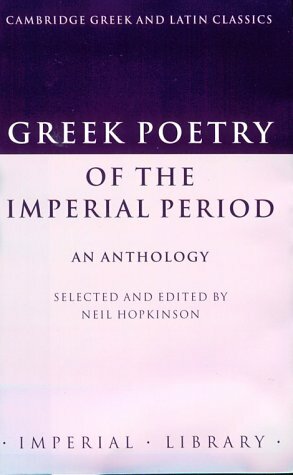 Greek Poetry of the Imperial Period. An Anthology.